Yellow-tailed black cockatoos enjoy a summer birdbath. On recent days off from work I’ve been volunteering for the Friends of the Hooded Plover Bellarine. 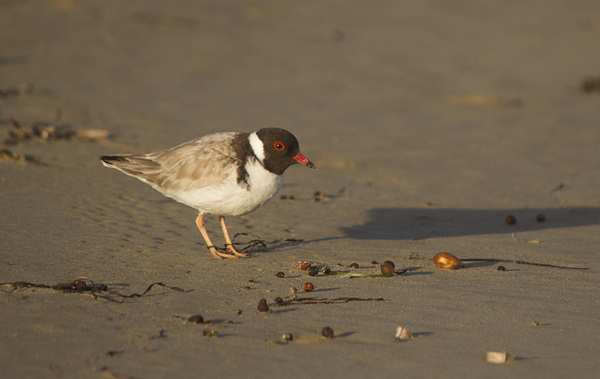 Hooded plover numbers are listed as ‘vulnerable’ in Victoria. It’s a beach nesting bird found around Ocean Grove, Breamlea, Point Lonsdale and 13th Beach. 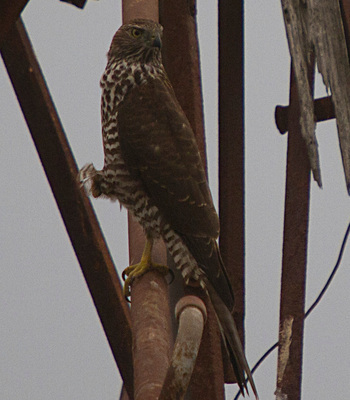 From August to April each year the birds try to raise chicks but struggle due to impacts from people and predators. The volunteers work in partnership with Birdlife Australia and Barwon Coast to monitor the birds along the coastline, locate their nests, assist with erecting protective signage and fencing, and warden the sites after hatching. I volunteered for a few hours at 13th Beach a few weeks ago but the three plover chicks that hatched there were killed by silver gulls on their eighth day of life. Then two chicks were seen at 17 W, between Ocean Grove and Barwon Heads. These chicks are doing well so far. A large area of the beach has been transformed into an exclusion zone, which the majority of beach-goers are happy to respect. I hope to report good news about these chicks in the next edition of the Voice. While standing on the beach I’ve seen red-capped plovers, pacific gulls, and red-necked stints. I had a wonderful experience at 13th Beach when I met a husband and wife who were keen bird-watchers from northern Denmark, who especially wanted to see a hooded plover. The husband had an amazing knowledge of Australian birds. He has travelled the world in a quest to see at least one bird from every family of birds. He had never seen a bird from the bristlebird family, so his next stop was Point Addis to find a rufous bristlebird. He also wanted to see an emu-wren. His wife liked the scenery more than the birds but was happy to support her husband in his bird quest! We had an interesting discussion about the Queenscliff egret colony, first seen by Tom Fletcher. The Danish couple had noticed the little egrets and the nankeen night herons along the foreshore in Queenscliff, and the husband told me he saw lots of swifts in Queenscliff. I have been to Queenscliff many times and have never seen a swift, so I said to him maybe they were welcome swallows or tree martins. My goodness, he gave me a very long look before assuring me that he knew his swallows, swifts and martins and the birds were most definitely swifts – in fact, he said ‘swifts’ very loudly several times to highlight the fact. 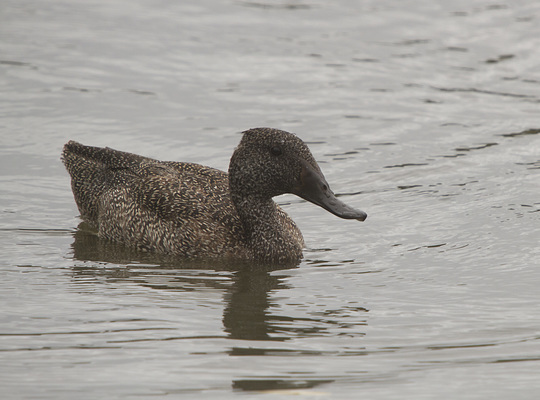 The other highlights of my fortnight were to see a wedge-tailed eagle at Curlewis, a collared sparrowhawk at Reedy Lake, around 50 freckled ducks at Begola Wetlands. 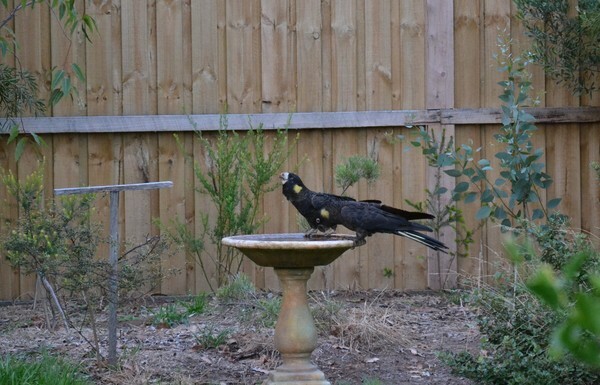 I received a lovely email from Lynn, of Ocean Grove, who has had yellow-tailed black cockatoos using her backyard birdbath, as well as little corellas and galahs . Lynn said she was watching telly when she heard the yellow-tailed black cockatoos call out, and she saw four of them in the bird bath, which was so exciting. Of the 32 species of birds that have visited Lynn’s garden over the eight years she has lived in Ocean Grove, 22 have used the birdbaths. 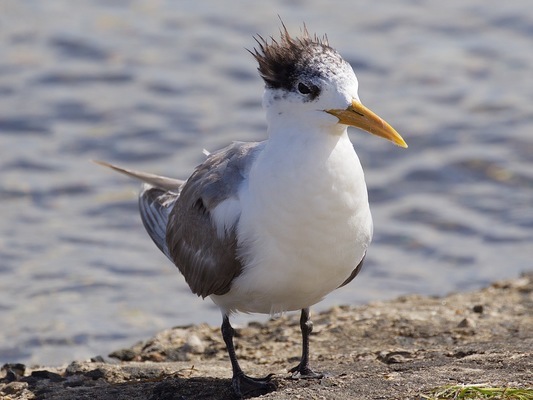 I also received an email from Kevin, who took a wonderful photo of a crested tern. I received a message from Pete and Chris, who live in Woodlands, saying they saw their resident kookaburras with a fledgling but the family had not used the custom built hollow nest in Pete and Chris’s garden. The kookaburras must have found another hollow big enough to accommodate a kookaburra family, which is a shame for Chris and Pete as they have loved observing the kookaburras in their garden. Thanks so much Chris, Pete, Kevin and Lynn for the wonderful emails and observations.